The oldest face of Indian automobiles is set to get a radical makeover with a new design and styling. 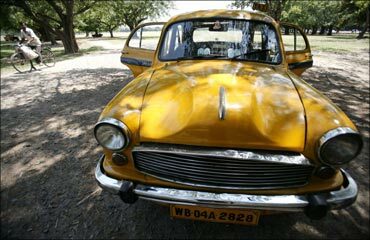 But not many are convinced whether nostalgia and the latest move by Hindustan Motors would be enough to ensure a smooth ride for the Ambassador (Amby) in future. 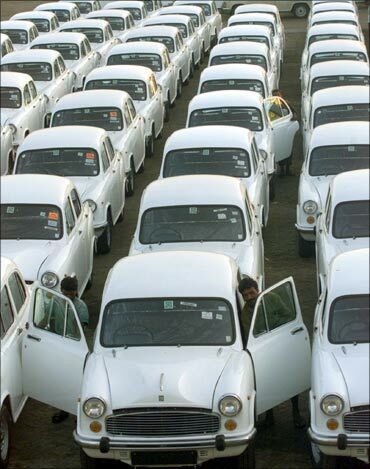 Many say that the Amby is to Indians what the iconic Volkswagen Beetle is to Germans. But the similarity ends there. 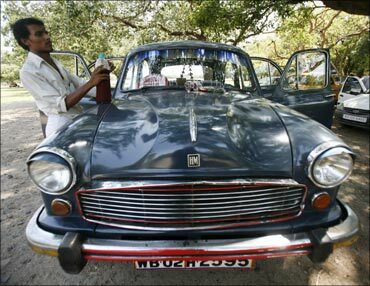 While Europe's largest car manufacturer has painstakingly resurrected the original 'People's Car', making it one of the most popular small cars ever made, the Amby has had a neglected past. The biggest problem is while the Indian auto market has changed completely, HM has remained in the past for far too long, giving almost a free run to newer models from nimble-footed competitors. 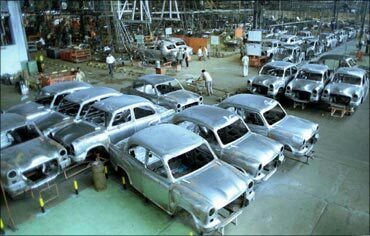 Image: Ambassador cars at Hindustan Motors plant. India's top automobile designer Dilip Chhabria says, "It's an uphill ride. Apart from some very timid efforts, they haven't done anything to it for decades. Being an icon is what has powered Amby sales since 1950s. I believe the company should treat it the way Porsche has treated the 911, and BMW has treated the Mini." The five-seater Ambassador has so far largely retained its first generation styling borrowed from Morris Oxford III, even 50 years after Morris Motor Company, the United Kingdom-based auto firm discontinued the model. Dated looks, a fuel-guzzling engine and raging competition pushed the Ambassador down the popularity charts as it now records less than 400 units a month in sales, with more than 50 per cent of it coming from government and institutional demand. But HM wants to change all that and has kickstarted a development programme for a completely new Amby, sporting a new design and styling -- both exterior as well as interior. Image: HM's Ambassador, the iconic workhorse. HM says the all-new range, which will debut in the second half of next year and will cost more than the present day model, shows the company's commitment to cater to varied aspirations of new-age customers. HM managing director Manoj Jha says the company is working on several variants of the Ambassador. The one with micro changes will debut soon and the one with macro changes will be introduced later. The company, according to sources, is also planning to have a shorter version of the car, which would qualify it for the excise benefit given to compact cars having length of less than four meters. This new small car may get launched earlier than the new Ambassador. HM is expanding its research and development wing rapidly and carrying out most the work for the new Amby in-house. Image: Ambassadors at HM's Uttarpara plant. Some of the complicated process such as design and styling has been outsourced to a Pune-based design firm Onio. Design is one area which, experts believe, would require huge attention as it is crucial for engineers to carry forward the basic styling of the Amby, which has remained the same for the last 40 years, while keeping the essential and practical style elements intact. 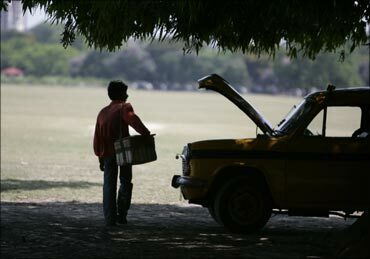 Chhabria adds, "The success of the new Amby depends on how well the company treats it. But I believe HM lacks the creative intensity to make significant changes. It has a fabulous legacy, and if it does it right, it could have a great upside." HM is bending backwards to remove the drawbacks of the current generation model which lies in its noisy engines. The company says it will strap the new model with a new engine that is more powerful and efficient. "There will be different types of engines for different variants of the Ambassador. Some of these will be produced in-house. HM is also keen on establishing a partnership with a European company for technology transfer," says a senior company executive. While some new variants will be targeted at the mass segment with an affordable price tag, a more 'refined' segment of buyers will get a more luxurious Amby with added features. The company thus expects to more than quadruple its monthly sale of the car to about 2,000 units. HM is also keen on reducing the share of government and institutional sales and promote the Amby among individual customers. The company is doubling its dealer network to 140 to enhance the retail count. A Chennai-based auto analyst says, "It would not be easy for the company to shed its present image. But on the upside, even today, people talk about the tank-like build of the Amby. The all-new version is hopefully built keeping in mind the basic essence of the car". Click NEXT to check out the Rs 4.4-crore Amby . . . 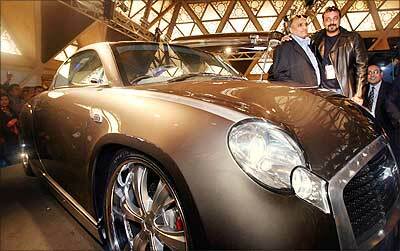 The Amberoid is a souped-up version of the Ambassador built by India's best known automobile designer Dilip Chhabria. 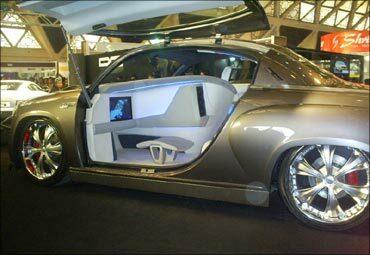 The car, which seemed like a concept vehicle, was actually a practical project built to serve some high net-worth individuals. It was first showcased at the 2008 Delhi Auto Expo, the same event where the Tata Nano was unveiled. More than 25,000 man hours were put into the project, according to DC Design, the company formed by Chhabria. The car sports a Rolls Royce-developed V12 engine and comes with a unique three-seat configuration. Its doors have been designed in a way that they would open skywards. Three 7 inch LCD screens dominate the interiors. Internet, satellite navigation, camera output, movies and video conference can be had on these screens. The Amberoid comes with a king size rear seat and can change colour to suit the mood of its occupants. It has a camera fixed near the rear door which provides assistance while reversing.